Auden captures a truth here that has always been evident to me, yet remains elusive in the ongoing rush of life. When one is distractible or detail-oriented, the proclivity to have mindful awareness hijacked by the noisy or urgent is even stronger, and the need to discipline one’s thoughts becomes crucial to sanity and survival. I’ve found that it helps to deliberately seek out the beautiful, interesting or joyful. Life is astoundingly abundant with gifts that are easy to ignore. When I start looking for them, blessings are evident everywhere. Today, I hope you will go on a sort of “scavenger hunt” in whatever place you find yourself: search out what is lovely, happy or fun, but easily overlooked. Take a few mental (or digital) photos. If you like, share your observations here, but most importantly, file them away in your joy bank, to be withdrawn as needed in times of negative emotional cash flow. From my joy bank account that was only opened about two-and-a-half months ago: Rain. Incessant. Some reports have my area 18 or 19 inches over the normal amount for this time of year. Wildflowers. Always present during summer months in the mountains. This year there are more. They have larger blooms. I even think I have seen new blooming species that were not present during the dry weather this time last year! Every turn in this beautiful world is different – even the tortuous or scary sharp curves of life – interesting. Eric, I agree completely! It reminds me of the old, supposedly Chinese proverb (or curse? :-))”May you live in interesting times.” That we do. You seem to be among those who like rain. I love it, although I wouldn’t want to go long stretches without sunshine. I’d prefer the Camelot way: “The rain may never fall till after sundown.” In any case, rain is definitely a blessing. I wish I could see the mountain wildflowers you describe. I guess the mountains are especially favorable to beautiful flora and fauna. I love the various types of wildflowers throughout the USA. 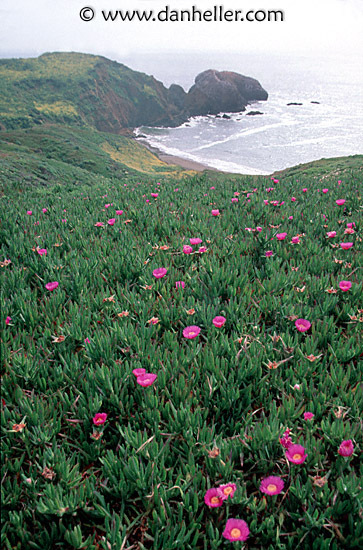 I used to love to see the Ice Plant in California (so ubiquitous there that I called it “California kudzu”) as well as the Bouganvillea that were seemingly everywhere. But perhaps my favorite wildflower memories are the Bluebonnets and Indian Paintbrush in Texas. It seems that abundant rain brings many blessings; possibly a metaphor for life. Thanks for giving me some beautiful mental images this morning. Beautiful photo and thought provoking quote…thank you! I’ve started my scavenger hunt and just saw a Cardinal at my bird feeder; the Cardinal was feeding a small bird who was also at the feeder. interestingly, the other bird was not a baby Cardinal. Can’t wait to learn what the rest of my scavenger hunt will uncover. Thank you agin fo sharing your talents with us! Oh Ann, what a cool thing to see! I love Cardinals – thought they are our state bird, I don’t see them as often as I’d like – but seeing one with a different baby bird would be so fun! Thanks for sharing this delightful sight with us – I hope you have a day full of great mental snapshots! This flower looks alive in the photo, like it should be emitting its fragrance! I noticed the droplets of water (or dew) on the smaller one. Gorgeous! I love your paragraph encouraging us to capture the thoughts. It brings to mind Philippians 4:8 “Finally, brothers and sisters, whatever is true, whatever is noble, whatever is right, whatever is pure, whatever is lovely, whatever is admirable—if anything is excellent or praiseworthy—think about such things.” Years ago, I heard a preacher call this “8 in 8”, the catch phrase stuck. This is a great go-to verse. I will be a “hunter” today for the beauty God has given us. Mary Ann, for years, Philippians 4:8 was my favorite verse in the Bible. It’s still right up there in the top ten. It’s the underlying philosophy of this blog – thanks for quoting it here! Happy hunting, my cheerful and cheering friend! Oh, my, Sheila! If you’re stuck at home, maybe you could hunt through some old photos, cards and letters or browse through magazines or listen to music…can you tell I’m a packrat? 🙂 Hope your car is running soon! Sheila, I’m so happy your car was easily fixed. I love green peppers! Our older son used to complain that I put them in everything I cooked, and I practically did after reading how nutritious they were. Don’t you just love seeing those little flowers on peppers, tomatoes and other plants, promising good things to come? It really is a joy to grow your own food. Thanks for your ongoing prayers! I just love the way cats are such expert relaxers. Sometimes watching a sleepy cat almost makes me sleepy. I may be biased because Pasha was jet black, but I think black dogs and cats add such an elegant touch to any room! Thanks for sharing a sweet mental snapshot. Double daffodils? Yesterdays were definitely tulips-” Bearded” variety. I think that must have been a double daffodil, though it’s been so many years, I couldn’t say for sure. 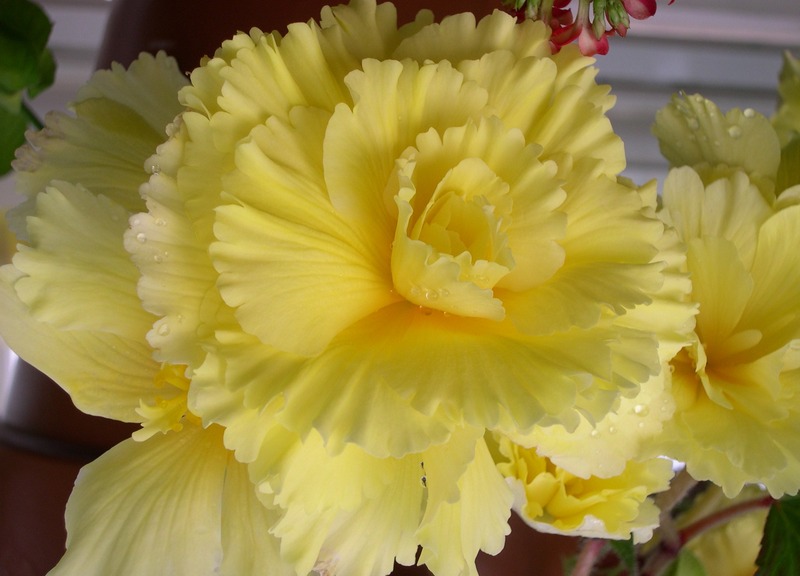 Daffodils are my favorite flowers. I planted some doubles at our York home, but they are so heavy in full bloom they won’t stand up unless I stake them to chopsticks or something similar. I guess if you plant them very close together they will stand up better, but what about the ones in the front row? The never appear to be staked in the bulb catalogs! ‘…file them away in your joy bank’ is such a lovely turn of a phrase. I’m going to remember that. At one point today, I had three different cats on my desk. That made me giggle! I just love the way cats are so agile that they can go anywhere they want. Although I confess I was relieved my dog couldn’t do that! LOL! Yes, a dog on your desk would be something. One of the cats, Slinky, is a wild little thing. It took two years to even bring her indoors. She used to hiss, bite and dodge all attention. Now she spends the entire day sleeping in her little bed on the back of my desk. She’s great company. Sounds like Slinky just needed a little TLC and some time to settle down. It’s funny how animals can be so alike and yet have their own unique personalities, not too different from people that way, I guess. I used to love to hear our cats purring. It’s such a soothing sound. Having one sleeping near your desk would be better than a white noise machine! The Conservatory garden in Central Park has some amazing Alliums- some almost a foot across that look like basketballs. Never seen Alliums that big. Wow, that must be amazing. I’ve rarely seen alliums at all, and certainly never any that large. Next time I’m in Central Park, I’ll have to make it a point to see the Conservatory garden; I don’t remember seeing it.